To celebrate Christmas this year, I thought I'd bring you the words across the Irish sea, an emigrant's lament, a cousin of mine from the Russianside, but one of my grandmother's generation. Fr Tom Doyle was one of two brothers to enter the priesthood and both spent their years in England and beyond. This piece was published in the Munster Express in the 1960's and the clipping was found by a relation of mine recently. And wished I were back home in Ireland. Blinking "welcome home" to Passage and to Crook. To Cheekpoint and my home of days gone by. When Christmas really was a feast of joy. That led to Faithlegg Church and Midnight Mass. The heart greetings "Merry Christmas Pat"
The same to you, may all your pigs grow fat! Spurred on by turning wheel to cook the meat. The crowded table on the old stone floor. The stranger always welcome at the door. The lamp-lit darkness of the Christmas night. The fiddler played, the elders danced with glee. And Grandpa bounced me on his bony knee! And Irishmen knew how to praise the Lord. I see it all and sigh, and inward' pray. The house described above, is my aunts, Margaret O'Leary. His Grandpa was my own Great Grandfather; Joseph (called Jose) Doherty of the Russianside who was married to Ellen nee Walsh. They had 9 children; one was my Grandfather, Andy, another, Tom's mother Ciss. 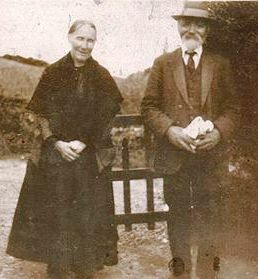 Ciss married a Wexford man named Joseph Doyle and they had 6 children, Tom was one of the youngest, born in 1919. The family emigrated to Liverpool early on. Tom and his older brother Michael, both entered the priesthood, Tom was ordained a priest of the Monfort Fathers in 1948. Fr Tom arrived to Cheekpoint every summer for his holidays and offered mass in local homes, and always mass at Faithlegg church and Crooke if required. I recall one Sunday, when I was serving as an altar boy. A new PA system had been recently installed, so that the priest didn't need to strain his voice to be heard. Now Tom had no fear of straining his voice, which boomed out and dominated every conversation. As my Father put it, "you'd hear him in Wexford even if there was a gale from the east". When Tom started mass that morning even the sleepiest parishioners sat bolt upright under the aural assault. So much so, that during the mass I was called back into the sacristy by the chapel woman at the time, Joan O'Dwyer and told to turn off the PA.
Fr Tom was the only priest I ever heard called by his first name, something he actively encouraged. He considered Cheekpoint home, and never missed a visit to the Russianside. One of my fondest memories of him was the summer I was asked to show him round the village, and tell him the names of the people inside and who they were related to. 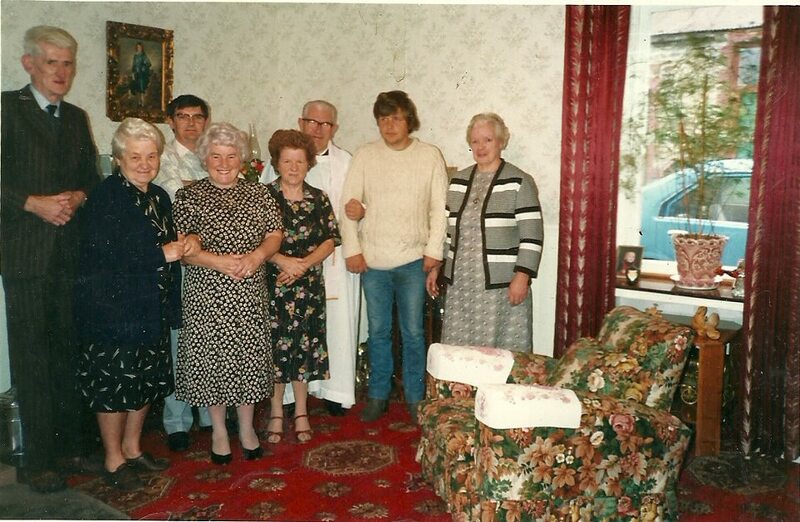 Once I connected it back to my Gran's era it all fell into place with him, and when the door was opened he was immediately at home, and always welcomed. On the occasions I got inside the threshold, I'd be treated like royalty, even if the occupant would turn their head to me normally. Fed and watered and occasionally an envelope passed to Tom for prayers, we would saunter on to the next house and my intelligence called for once more. At the end of the visits each day, there was "an economic recompense for my time", as he put it. The one thing I never realised until I started to research this piece, and certainly not apparent from the poem above, was that Tom wasn't actually born in the Russianside at all. I can only imagine that having been born into the Irish emigrant community of Liverpool, the Christmas traditions must have been ingrained into him from the stories of his mother and his older siblings. It was obvious to me all those years ago, that he certainly felt like he was coming home each summer. Fr Tom died on the 10th November 1997 aged 78 and was buried in his communities burial ground at Romsey near Southampton. His obituary has more of his career.